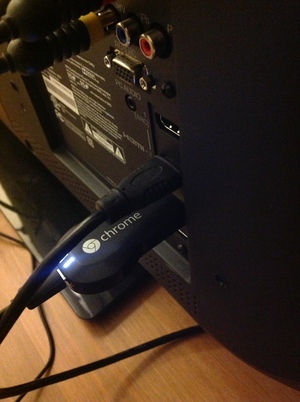 A few weeks ago, I received my Chromecast in the mail. This is a small $35 device sold by Google that vaguely resembles a USB flash drive and fits into the HDMI port on your TV, and connects to your WiFi. For what it does, it is a very nice device. 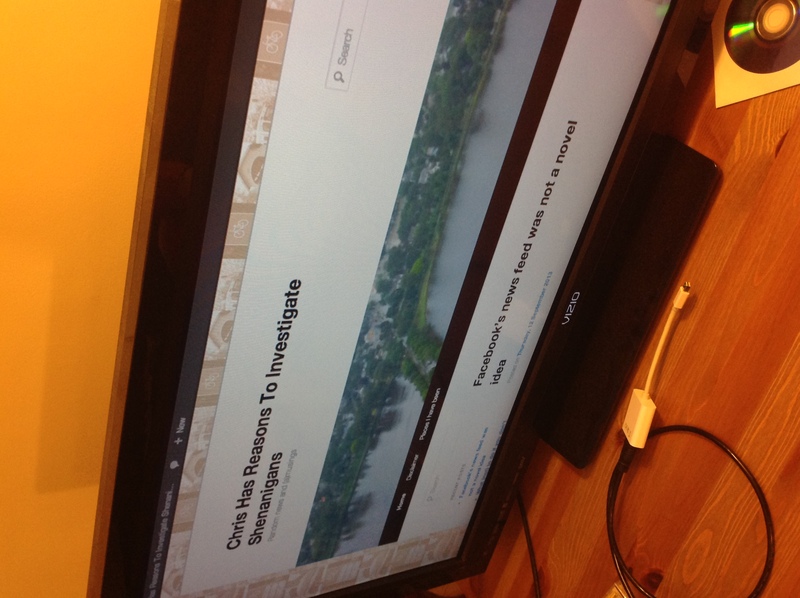 Chormecast also allows you to send any Chrome browser tab on your computer to your TV. This doesn’t work quite as well as the built-in apps. 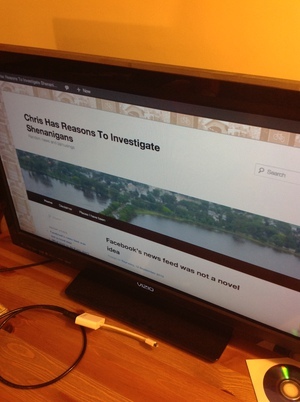 For one thing, there is a delay of a few seconds between something happening in the browser tab on your computer and the display of the tab on the TV. (Fortunately, the sound also gets delayed, so watching a video in a Chromecasted tab will mean the sound and video will be in sync on your TV.) Second, this is bandwidth-intensive when watching a video, since the computer has to stream the video from the Internet and then restream it to your TV over WiFi. So, it’s better to use the built-in apps to watch Netflix and YouTube. Nevertheless, casting tabs still works good enough. The other night, I Chromecasted a NYT article on the president’s Syria speech, and played the embedded video of his speech. It worked fine. Now, this device is not really that necessary. My TV has built-in apps for Netflix and YouTube. Likewise, as you can see from the photo above, it’s perfectly possible for me to hook my computer up directly to the HDMI input on my TV, which would allow me to send the whole screen to the TV, not just what I can get in a Chrome tab. 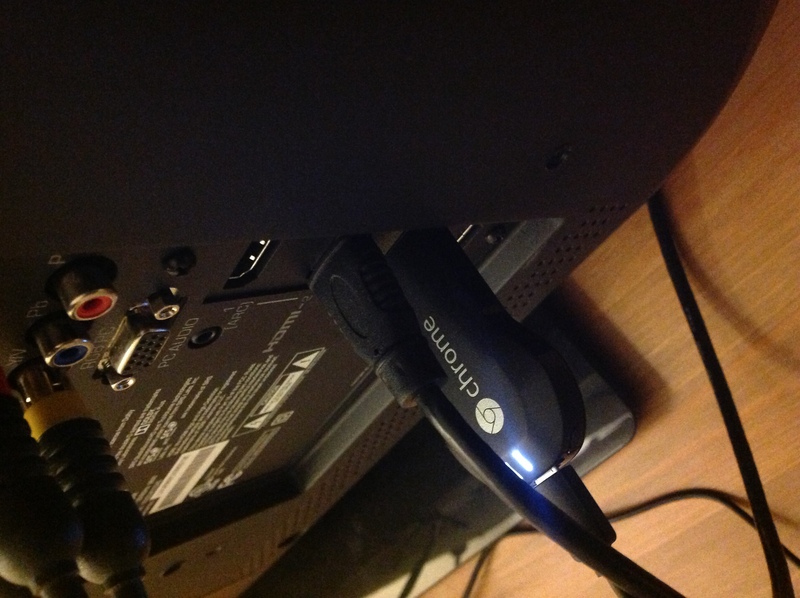 But Chromecast is much easier to use than my TV’s built-in apps, and less awkward than stringing HDMI cables back to the couch. For $35, this nice little device is a good help.